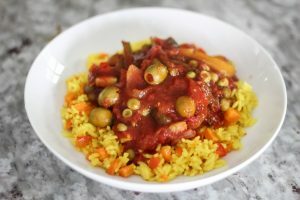 I created this cuban rice when I was coming up with my Vegetarian dish, inspired by Ropa Vieja. I love me some cuban food. This rice perfectly compliments the recipe I came up with for my gluten free/vegan version of Ropa Vieja. 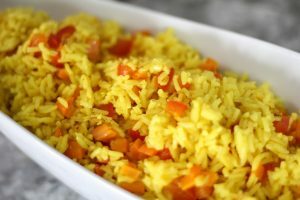 Originally I was juts going to have it be plain yellow rice, like the restaurant I go to. But it’s just not as esthetically pleasing to the eye. Plus the more flavors the better, I think. So I decided to add carrots and a bell pepper to the mix. If you are looking for 1 pot rice that has a punch of flavor… look no further! Chop red pepper and dump all veggies into a large pot. 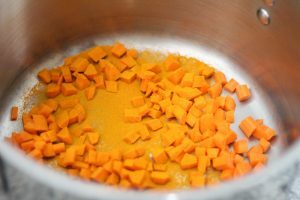 Add rice, water, bouillon, oil, salt and turmeric. 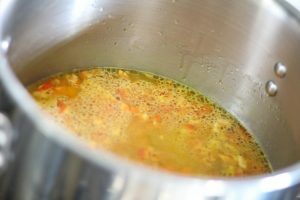 Once boiling turn to low until cooked. Find the Vegetarian inspired Ropa Vieja recipe I served with this rice here. I’ve never had Cuban rice before, but yum, it looks delicious! Yellow rice is my fav. This looks like a great alternative! Girl this looks SO good! Love that it’s gluten free too! 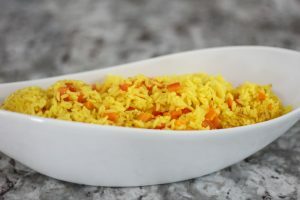 A good rice dish is always a hit for my whole fam- we’ll have to try this!